The PSB T20 Tower delivers the highest quality acoustics in the new Alpha Series and will easily fill any size room with lush, full-bodied sound. Leveraging the latest research in acoustic design and most advanced cabinet and driver technologies, the all-new Alpha tower adds an additional custom 5.25” woofer, while utilizing the Alpha Series’ patent tweeter and crossover design, to deliver bigger and bolder sound with flawless imaging. With a centre channel to match, the new T20 tower is the perfect start to creating the ultimate surround system. The T20 uses a 0.75” black anodized aluminium dome tweeter to extend the high-frequency response further than any Alpha ever before while lowering distortion to deliver a lush soundstage full of details. Unlike lesser designs at this price, all the new Alpha Series tweeters employ ferrofluid cooling to prevent dynamic compression and a neodymium magnet for high sensitivity. The tweeter’s front waveguide and its unique placement below the woofer work together to smooth the response at the crossover and perfect on and off-axis performance. 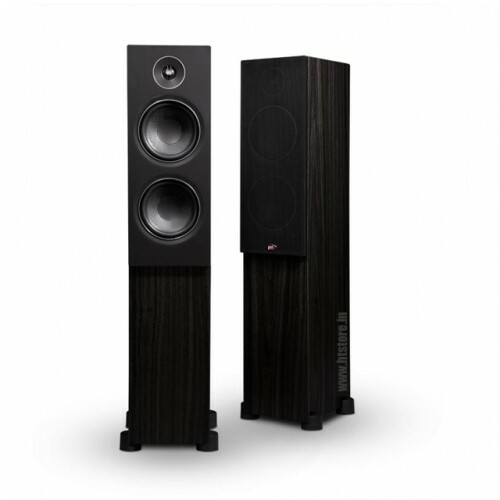 The redesigned Alpha Series tower features a new crossover that exceeds speaker standards with a innovative design that delivers the tightest control and the flattest frequency response. Developed for more than directing low and high frequencies to the individual drivers, the crossover used in the T20 employs a very advanced acoustic Butterworth low-pass filter in the cross to lower distortion and create a large, detailed soundstage for the best listening experience. Using a special MDF material and a unique combination of wall thickness and bracing, the Alpha T20 Tower flawlessly controls resonances while leveraging a light internal material that has been accurately positioned to reduce standing waves. The sturdy, well-constructed cabinet is finished with a high-quality wood grain vinyl and features acoustically-transparent magnetic grilles that make the speakers disappear into your décor without sonic interference.